NAME THAT MOVIE Every classic film features iconic images that are unforgettable to movie lovers, from the house on the hill from Psycho to Pulp Fiction's the Big Kahuna burger to the giant dinosaur sculptures of Pee-Wee's Big Adventure. In Name That Movie, celebrated illustrator Paul Rogers tests our visual knowledge of the world of cinema, highlighting both obscure and instantly recognizable references to 100 classic films, from the golden age of cinema to the blockbusters of today. The rules of the game are simple: each film gets six line drawings, delivered in sequence, and-here's the clincher-no movie stars. 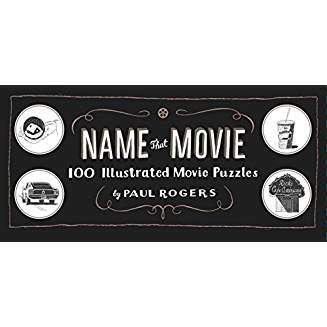 Complete with answer key and index, this elegant gift book will delight cinephiles who will see their favorite films in a whole new light.